Images in email signatures - linked or embedded? The HTML format, by now the standard for pretty much all email correspondence (business, marketing and even personal), allows for 2 ways of inserting images into messages – linking and embedding. The choice may seem trivial, but in reality the difference is between e.g. a marketing banner being displayed correctly in the recipients inbox or being blocked and displayed as the dreaded ’empty box with red x’ (Fig. 1). Fig. 1. Famous ‘box with red x’ indicating issues with an image. This entry was posted in Tips and tagged embedded image, issues, linked image, tips on October 4, 2013 by Adam the 32-bit Aardvark. Also, are you using a linked or embedded image (http://www.mail-signatures.com/articles/images-and-graphics-in-email-signatures/), what other ways have you tried and what was the effect (i.e. square with red “x”, error message, nothing…)? This article is a bit frustrating, in that it doesn’t fully explain how to set up an embedded image, which would have been nice. Thanks for trying, anyhow! Thanks for the comment. I’ve added a link at the bottom of the article to CodeTwo Exchange Rules software, which allows you to use embedded images in organization-wide signatures on Exchange Server. Watch this video to learn how this is done exactly: youtu.be/mhBONmOzi2g?t=1m20s. As for Outlook, you embed images in signatures using the Insert picture button (marked red in the image I posted in my comment above). Unfortunately, Office 365, Google Apps and most webmail services do not allow for embedding images. See my Images and graphics in email signatures article for more. I’ve got an image embedded on my email signature but sometimes when a client receives an email from me, her software says there is an attachment? Originally I had the image as an attachment in the signature but this was causing the emails to be too large…. Nice article. Have a question about hidden attachment. Is it feasible to insert image having access and influence only on message content? I mean – I can enter any html code into my content, but I don’t have any option to attach file. The easiest way would be to convert the image to base64: http://www.base64-image.de/ (or google ‘convert image to base64’) and paste the base64 code into your HTML source. Unfortunately base64 is recognized by few email clients – see my comment under the Embedded images section. Is there a way to put signature along with company logo on every reply to clients on yahoo and Gmail emails. I know I can do it on PC, but my question is can I do it on smartphone like GALAXY S5 or any android phone? You can try applying this procedure: http://www.mail-signatures.com/articles/setting-html-email-signature-images-iphone/, but I wasn’t able to make it work on my Android phone. Googling “android signature with image” doesn’t return useful results, other than using non-default Android email apps, e.g. : http://android.stackexchange.com/questions/15552/html-signature-in-gmail-app. I want to know that how can i use html E-mail with images . Like i have a Image file and it has social media buttons and website button i have convert it totally in html but i want to know that how can i add it in my email signature which support by almost all email clients . Have you tried applying instructions from this article: http://www.mail-signatures.com/articles/add-social-media-button-email-signature/? I followed the instructions on how to insert a logo with the email signature and it worked but the image is too large when it’s received by others. How can I correct this? What type of image are you using – linked or embedded? Are you using a large image and reducing its size within the signature on your end? What email clients are the recipients using when they get the issue? IMO people should just refrain from using images in email signatures altogether. Hi, my email signature has a couple of linked logos in it. I’ve noticed that the new Google Inbox app displays those images in the preview line – is there a way to prevent that? When I tested Inbox only images that weren’t hyperlinked were displayed in the preview. The only advice I can think of is to make sure you’re using the latest version of the app (go to Google Play and looking up Inbox). Im interested in finding the best way to do signatures for a large company that will have 9 variations of the email signature, about 70 staff at each location. 9 locations in total. the best way to get them on the computers.. ? I am trying to add a logo to my signature on owa. I have inserted the logo image along with the text, it looks fine to begin with as it all appears normal. However when i email someone the text appears but not the image, instead it just says “pasted image” where the image should be. It works fine on outlook but not on owa. Is there a reason for this?? Can you help me fix my frustrating issue?? This issue is specific to Google Chrome. What Internet browser are you using? I have tried using Chrome, Internet Explorer and Outlook. In Outlook it appears how I want it. However in both Chrome and Internet explorer it comes up with “description” loads of times where the image should be. Can you confirm whether you are inserting the image as per my article: http://www.mail-signatures.com/articles/how-to-insert-images-into-office-365-email-signatures/? If not, try it out. If you have tried applying my article in Internet Explorer and the issue persists, let me know what IE version you are using. Also, give Firefox a try as well (in my tests the issue was present only on Chrome). I am unable to link my images to my email signature that I thought I had professional created. The images don’t show up and I tried in Outlook and roundcube can you please help for roundcube? I am experiencing the same problem with Roundcube: I have the HTML signature option enabled and the codes seem right, I can’t visualize the icons I am trying to insert in the signature (I get an icon which looks like a torn photograph instead). This is happening both on Chrome and Firefox. What method are you using to add the icons to the signature? Have you tried using the HTML code editor (as per this video: https://www.youtube.com/watch?v=2khxl9jEofk)? Hey Pawel, hopefully you can help. Running Outlook 2010. I am trying to add a company logo to my signature that is hyperlinked to the company website. This is how it works on coworkers systems also running 2010. When I add the logo in signature editor, nothing happens, it doesn’t appear. It is there however. I know this because if I now go to send an email, the logo appears in the signature. The problem is that since I can’t get the image to appear in the signature editor, I can’t add the hyperlink to it. This is an embedded image and I have tried both jpg and bmp files. It has to be a settings issue or image issue since my coworkers are running the exact same setup and they don’t have this problem. 1. What method are you using to add the logo in the signature editor (insert picture button in the editor, add copy/paste from external source, other)? 2. What is the size & dimensions of an example problem jpg image and can you upload it somewhere so I can take a look? 3. What happens when you try adding a png or gif image? I would like to add an image into my webmail roundcube. I understand that dragging and dropping is no longer available. It appears from the string of comments that embedding and linking is the way to go…with linking how do you do this? 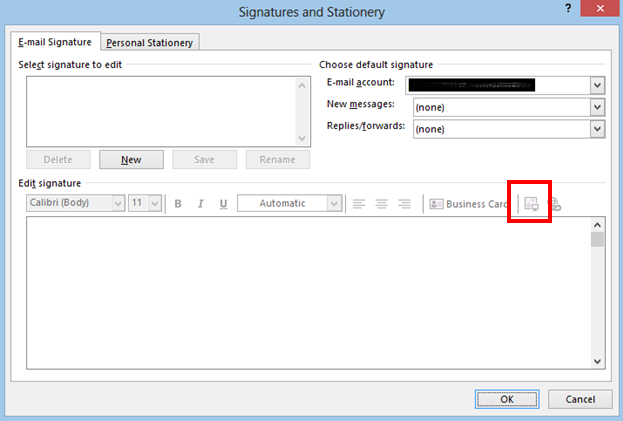 I have set up the image signature in my Outlook easily but am wondering how to do this with roundcube. Could you go over how to add an image in the signature for Roundcube – webmail application. I understand dragging and dropping won’t work. I’m not sure how to link or embed. Linking seems the way to go now. I was able to attach the signature to Outlook easily. As far as I can tell, the only thing you can do is upload the image somewhere on the web, and then copy/paste it into the Roundcube editor or switch to HTML view (“HTML” button next to hyperlink buttons) and insert the image using the <IMG SRC> tag. Hope you can slove my problem. 1. I have my html signature coding in the notepad, saved in htm format with UT-8 format. 2. when i insert the coding with my outlook signature, the logo’s sizes are getting changed. Have you tried defining the size of the image in the html code (e.g. as per this article: http://www.w3schools.com/tags/att_img_width.asp)? If so, how exactly? Also, make sure that your picture’s DPI value is 96. Please resize the picture you want to insert to a manageable size (generally, you should not use images over 100 KB) using any graphics editor software. After that, try to add the resized image again. Also, if you try to add your whole email signature as a picture – that might not be the best way to do it. Please take a look at the templates in our free Email Signature Generator to see how an optimized email signature should look like. I don’t think there is an option to do this directly from the Outlook for Mac. However, you can use our Free Email Signature Genarator to do this and paste the signature with the online image to the Outlook for Mac signature editor.